The Best Thai Food blogs from thousands of top Thai Food blogs in our index using search and social metrics. Data will be refreshed once a week. Also check out Top Thai Food Youtube Channels list for Top videos on Thai Food. Canada. About Blog Authentic Thai recipes with step-by-step video tutorials by Pailin Chongchitnant, cookbook author, TV host, and YouTuber. Facebook fans 46,753. Twitter followers 1,944. Bangkok About Blog Eating Thai Food feeds you with the best restaurants in Bangkok, delicious Thai street food, and easy to cook Thai recipes. Facebook fans 24,362. Twitter followers 4,616. United States About Blog RK Thai Kitchen & Beyond focuses on authentic Thai food flavors. Facebook fans 139. Twitter followers n/a. San Francisco, CA About Blog For all Thai Recipes, Cooking, and Secrets. Facebook fans 1,181,199. Twitter followers 539,384. Thailand About Blog Find videos on Thai food, Thai street food, Thailand travel tips, Thai recipes, Thai markets, Thai culture, places to see, things to do, eating Thai food and much more on this channel. Facebook fans 801. Twitter followers n/a. Chicago & Bangkok About Blog SheSimmers is about Thai cooking, Thai culture, Thai history, interviews with Thai cooks, and dining in Bangkok and Thailand. Facebook fans 9,415. Twitter followers 4,830. Thailand About Blog Food is the reason you should travel, and on my channel you'll watch videos that feature incredibly delicious food and travel tips. Mark Wiens a food obsessed travel blogger, freelance writer, and author of the Eating Thai Food Guide and Bangkok 101 Guide. You'll find here street food videos, travel vlogs, and plenty of Thai food videos. Facebook fans n/a. Twitter followers 17,305. Thailand About Blog Follow Thailand street food for Thailand bangkok street food videos guide and cooking Thai food recipe. Facebook fans 80. Twitter followers 22. About Blog A Thai Pianist is a portal of Thai recipes and articles written by Vatinee Suvimol. Facebook fans n/a. Twitter followers 4,481. Bangkok About Blog A community-led effort to serve Thai culture through its rich cuisine and exotic foods. Our passion is discovering culinary gems in the sprawling metropolis of Bangkok and our mission is to share them with you, dishing up culture, tradition and people behind the savory treats along the way. Facebook fans 3,407. Twitter followers 2,058. Facebook fans 263. Twitter followers 3. Bangkok, Thailand About Blog This blog is for anyone who has ever wanted to eat, or learn more about eating, at any of the food stalls lining the streets in Thailand. Facebook fans n/a. Twitter followers 4,151. Bangkok, Thailand About Blog This is a blog about eating and food tripping via Bangkok, Thailand. Facebook fans 2,242. Twitter followers 417.
phuket About Blog Here are some places to eat in Phuket, Bangkok and Thailand. Facebook fans 91. Twitter followers 751. Toronto About Blog Toronto's source for local news and culture, restaurant reviews, event listings and the best of the city. Facebook fans 444,162. Twitter followers 599,466. USA About Blog Easy Thai recipes and home cooking. Simple step-by-step and photos for the best Thai recipes and Thai food at home. Facebook fans 724,529. Twitter followers 63,896. Chiang Mai, Thailand About Blog Chris & Angela are the founders of the award-winning Thailand travel and lifestyle blog, Tieland to Thailand. In this blog they highlight what and how they eat while living in Thailand. Facebook fans 10,722. Twitter followers 37,947. Melbourne, Australia About Blog Asian Inspirations helps you enjoy authentic Thai cuisine in your home. We have the best and most traditional Thai recipes. The best Thai food is just a click away. Facebook fans 164,791. Twitter followers 37. Singapore About Blog Eat and Travel With Us is a Food and Travel website based in Singapore.Their goal is to provide the best Travel and Food guides. In their Thai Food guide they recommend the best food and food joints. Facebook fans 2,906. Twitter followers 4,060. About Blog Bok a Malaysian Food Blogger covers various Thai restaurants and eateries around the country, and also many across international waters too. Facebook fans 2,019. Twitter followers 821. London, England About Blog Rosa's Thai Cafe blog want to share their passion for cooking and eating delicious Thai recipes & show you how to make them in their videos. Learn how to cook Thai food at Rosa's by Saiphin. Facebook fans 3,855. Twitter followers 2,160. Hopatcong, NJ About Blog Twist on Thai cafe is committed to providing our customers with authentic Thai food. Facebook fans 468. Twitter followers 1. Dallas, Texas About Blog Alex Snodgrass author and recipe developer of The Defined Dish shares Thai food recipes that are healthy and simple! Facebook fans 2,044. Twitter followers 94. About Blog Cooking Thai Food Recipes and Video Tutorials, view our collection of how to tutorial videos to cook famous food dishes from Thailand. Easy to learn how to cook healthy delicious meals found in popular Thai Restaurants. About Blog Thaifoodmaster is Hanuman's Thai food recipe journal. It’s where he write about Thai food in general and especially about the food that he prepare and eat at home every day. Thaifoodmaster stands up to educate the International community about authentic home-style Thai food cooking. Facebook fans 66,498. Twitter followers 47. Facebook fans 7,306,146. Twitter followers 6,434,655. 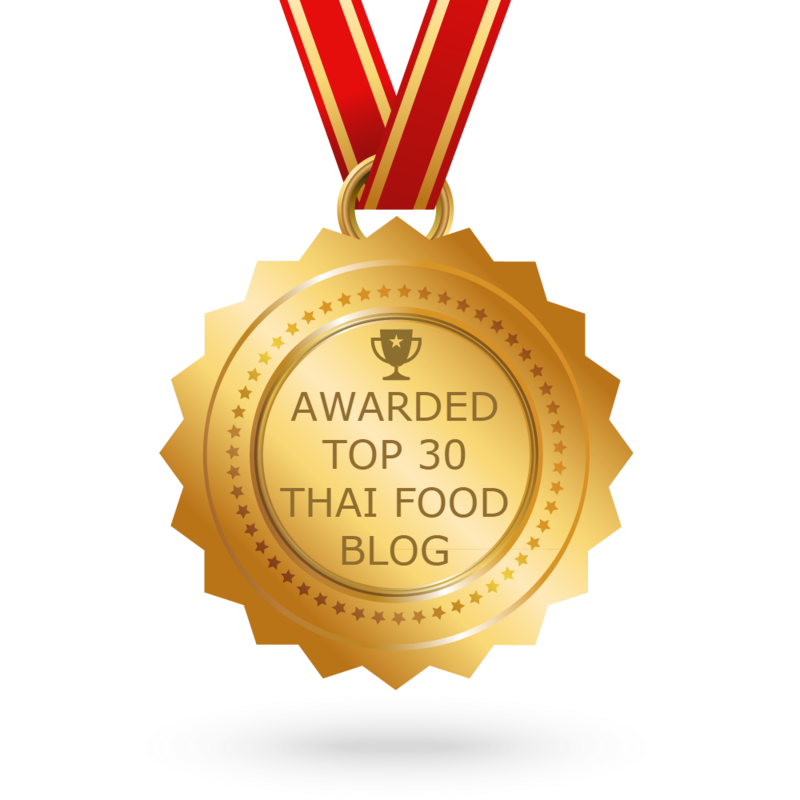 CONGRATULATIONS to every blogger that has made this Top Thai Food Blogs list! This is the most comprehensive list of best Thai Food blogs on the internet and I’m honoured to have you as part of this! I personally give you a high-five and want to thank you for your contribution to this world.